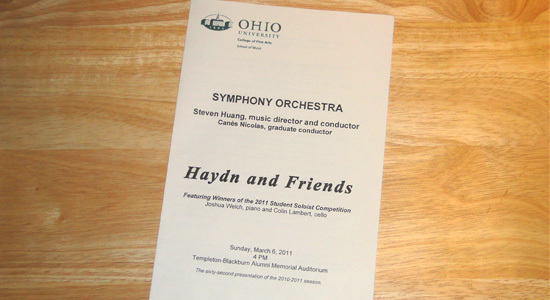 This afternoon Sarah and I were at Ohio University's Templeton-Blackburn Alumni Memorial Auditorium to see the Ohio University Symphony Orchestra concert entitled Haydn and Friends. The program featured concertos composed by Edouard Lalo and Edward MacDowell and well as a symphony by Franz Josef Haydn. The concert also featured solos by winners of the 2011 Student Soloist Competition; Joshua Welch, piano and Colin Lambert, cello. Sarah and I completed our afternoon of fine music and culture with a great meal and decadent dessert at Applebees. I encourage everyone in the area to take advantage of the entertainment and arts that Ohio University has to offer. Most are free and the rest are cheap.